You may have seen and heard the term hashtag. But, what is it? Why does it matter? So you see it’s simple, a Hashtag is a word, phrase, or set of characters behind a ‘#’ with no spaces. ie. #SmallBusinessSaturday, #ShopLocal, or #Caturday2018. Hashtags were originally used to categorize and make searchable tweets and posts around a topic. By using a hashtag you are telling the social channel you are posting on to categorize this post into a certain topic. Hashtags are a great way to drive organic traffic to your social media pages and then hopefully to your website as well. By using a hashtag associated with your business or the customers of businesses like yours you are making it easier for people to discover you and your business. This can be particularly good for local businesses. Prairie Giraffe is located in Gillette Wyoming. If I want to do business with other companies in Gillette Wyoming all I need to do is search the official Gillette Wyoming hashtag, #GilletteWy, and just for good measure, I’ll throw in a #ShopLocal. 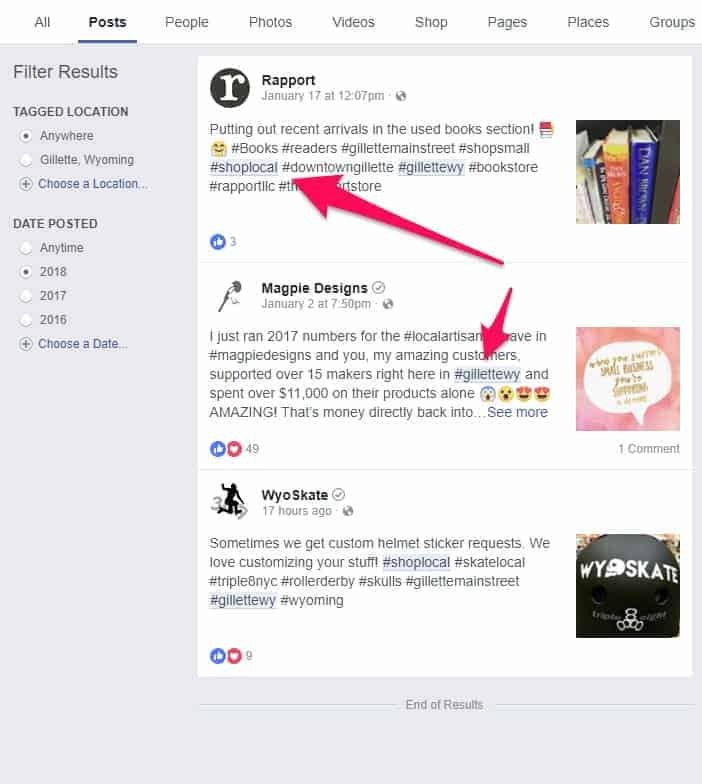 Now I can see all the businesses who are promoting themselves and their posts as local to the Gillette community and are trying to encourage others to shop locally with them. So you can see hashtags allow you to join in on the conversation and engage with a community of people and businesses you wouldn’t otherwise be connected to. Unlike other groups and forums, the conversation doesn’t require management. There are positives and negatives to the lack of control. For one, anyone can use your hashtag. An example is #quotes, you will find millions of posts and there will be a lot of “noise”. However, with a tag like #quotes, there will be tons of people who see that content. If you sell signs with inspirational quotes on them to hang in your home, you should use #quotes, but then also use something a little more targeted to your customers like #DreamLivingRoom, #HandPainted, and #ShopLocal. The upside is anyone can use and see your hashtag. By using a hashtag in your posts you are joining a larger stream. You are opening up your content to a larger audience. People looking for your content. Suppose you are wanting to get the word out to attendees of an event your business will be presenting at. You should start dropping in the events official Hashtag and those who are attending the event or otherwise searching that tag will see your posts in the stream of other posts with that same tag. Use hashtags whenever you are wanting to get the word out to a larger community and engage with new people on social media. We need to stop and just mention the use of Hashtags is only for social media. If you are using email to reach your customers then hashtags should not be used. Hashtags are a great way to promote your business. As we mentioned before using hashtags allows you to enter the larger stream of posts and get seen by more people. Tags like #ShopLocal, #SmallBiz, #SmallBusinessSaturday are all good general tags for small businesses. Other great small business tags are location specific. Like we mentioned before, the Gillette Wyoming Tag is #GilletteWy. By using this tag I am letting everyone who wants to shop in Gillette or is just searching for information about Gillette that we are a part of the community. Hashtags such as #ShopLocal, #SmallBiz, #SmallBusinessSaturday are general hashtags. The more generic a tag and the more often it is used the bigger the cloud of posts that use it. Then there are hashtags that are more industry specific. We recommend using a mixture of both. You never know which tags are going to help you the most so use both. General tags like #quotes, #rainyday, #ShopLocal, #beautiful, #instagood, are super popular and reach a large audience. Your posts can be washed away in the noise, but also have the best chance of being seen by someone. These are more specific and while they may never see the light of day, they stand the best chance of being gold. Someone searching a Niche tag are probably more passionate about what they are searching for and have a better chance of being fiercely loyal. Which is great for your brand! #FeedFeed, #CoffeeShots, #OutdoorLife, #ApartmentTherapy, #vitamix are examples of niche tags. 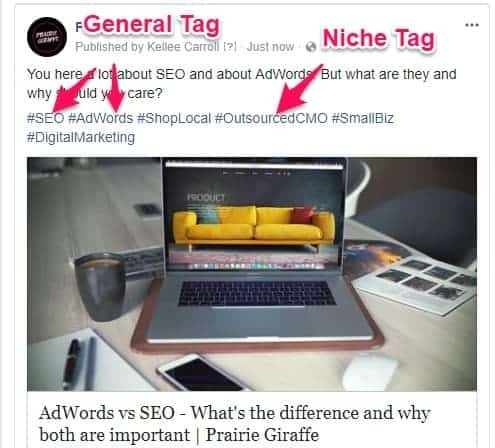 These tags will have a much smaller audience than most of the general tags, but they have an audience that are more likely to engage with your brand and are much more likely to follow you. You should use a mixture of niche hashtags and general/popular tags. You want your content and posts to be getting out to the most people as possible and at the same time attracting those looking for your products and services. A picture of this in action would be as Prairie Giraffe we make the following post. You can see we used very generic tags like #seo and used some very niche tags like #OutsourcedCMO, which is limited to our industry. We want to be discovered by people looking for SEO advice and ultimately SEO services and we want to show up for someone looking for an Outsourced CMO service. 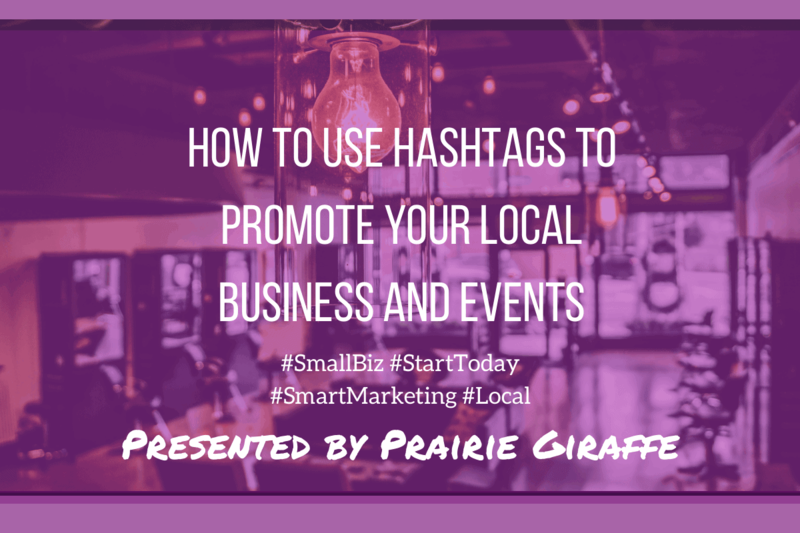 Using Hashtags to promote your events. We’ve touched on it before, but events are great places for Hashtags. It doesn’t make sense for every business at the event to make a page or group about the event. However, most events have official Hashtags. This allows all the news, conversation, announcements, and anything else surrounding the event to be gathered into one easily searchable place that doesn’t have to be managed. Imagine you’re holding an event for wedding vendors. You create official Facebook and Instagram pages and you make a few announcements on that page. That’s great. But, by having an official Hashtag for the event, you allow people to join in on the conversation about your event. They can make announcements, tell their customers that they will be there, show off the products they are going to bring and more. Without having to be an admin of your page. So if you are going to an event, it’s in your best interest to find out what the official Hashtag will be and start using it in your posts that pertain to the event. Are you announcing a product, are you bringing something special, do you just want everyone to know you’ll be there? There is no downside to using the events official tag. You will be helping make the event a richer experience for everyone and if your competitors refuse to use the tag, you are going to stand out from them. Another example – let’s suppose you are holding your own event. Nothing too big, just a special sale with some new products and a short class related to your industry. You need an official hashtag. What fun is a party if no one shows up? Imagine though if one of your excited attendees shares your hashtag. Other people see your fan’s post and click the tag (since tags act as links). They now get to see what’s going on and that they would like to attend as well. You know people tend not to do things unless they are incentivized so you make a deal with your followers that if they like your page and share your hashtag in a post they will be entered into a drawing for a free product, which you hold after the class. Now you are getting more shares than before and since the prize requires them to attend, even more, people are coming. This is just an example of the power of Hashtags when used with your Social Media. We will go over more amazing things Hashtags can do in the future. So get out there and #StartToday, #DontWait, #GrowthHacking, #SavvyBusiness. How do you follow your favorite stores online? You go to Facebook and Like their page. You love the videos they share of their latest products or creating a something amazing or delicious. You feel closer to those businesses, develop a relationship, and engage with them more than other businesses who don’t make the effort to share their activities and day to day with you. Who stays top of mind with you? A local company who exclusively advertises on Google or a business who has an active Facebook page and uses ads to target those who have interest in what they sell? The answer, of course, is the latter. Customers are going to use Google to find solutions to an immediate need. However, Facebook is a great place to develop the long-term relationships that will pay off with return business and connections to the larger community in your industry. Facebook is the people ask their friends who they recommend. You want to be on there and ready to be recommended by those you have done a good job for in the past. We have gone down this rabbit trail enough. This is not a post about why you should be using Facebook. This is a post about why you should be putting ads on Facebook. Here are just a few of the reasons you should be advertising on Facebook. Facebook is where people are at. Facebook boasts over one billion active users. If you’re trying to reach a particular group of people they are most likely on Facebook. Facebook ads can target people who are interested in your products and services. While these are not warm leads they are not cold either. This is far better than cold calling and other methods which are intrusive and can leave a bad taste in peoples mouths. For a local company being able to target customers Geographically is huge. Being able to target an area within a certain distance of your shop and combine that with interest or affinity targeting will really help bring in the leads. Facebook ad results are tracked. Using insights on your page and Facebook Ads Manager you can see exactly how your ads are doing. Who’s looking at them? Clicks, likes, reach, cost per engagement. All these metrics let you make decisions moving forward and let you see if your ads are working. Ad’s without analytics are not nearly as effective. Stabbing in the dark is not a good use of your money. Not satisfied with the results tracking from Facebook? Connect your Facebook ads to Google Analytics and see even more details. 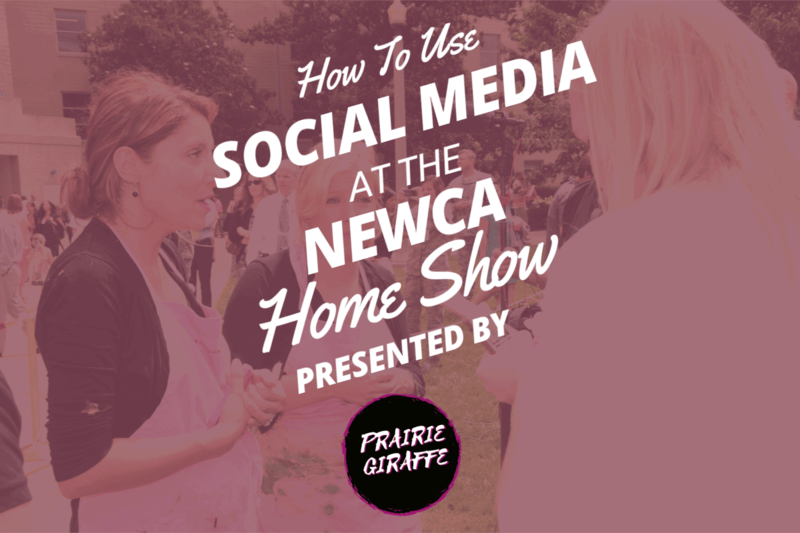 Here’s an article from Social Media Examiner on how to do it. Facebook is a great way to keep your customers informed on what you are doing and why they should come back. Ads can target those who have already shown interest in your Facebook page and visited your website. Using Facebook’s Custom Audiences feature, you’ll install a snippet of code on your website that will place a cookie on the computers of those who visit your site. With this installed on your site, the code will send information back to Facebook about which pages were viewed on your site by a specific visitor. Building custom audiences helps move people through your funnel and closer to a decision to buy. Facebook ads should be part of your inbound marketing strategy and are one of the most affordable options for online advertising. Contact us if you need help getting started or just don’t have time to create ads but know you need to. We’d love to help. Have you ever gone to your favorite bagel shop’s Facebook page expecting a lively page wishing you a happy (insert holiday 🙂 and maybe some specials, a few posts on how to prepare your favorite bagel from home, and other useful info? Only to find a ghost town. It’s disappointing. Today we even expect our dentist to have an active social media channel. We want to see if they are closed the Friday before Christmas. We love to be able to ask if they accept our insurance or if they recommend a certain type of toothpaste. We want to feel connected. If you are not managing your social media channels you belong to a large club. There are an astounding number of businesses who started a Facebook page, posted some obligatory test posts, and never looked back. It doesn’t have to be this way. You don’t have to miss out on all those opportunities to make a good impression on your potential customers. You can engage with your current customers and remind them why they want to come back. You need a Social Media Manager. We Come Up With New Content. You need fresh content and you need to stay on brand. Your social media manager should gather what you want to say. Events, sales, services, company BBQ’s, whatever, and create the posts to promote your events and business. We Give You Back Your Time. Creating all that content takes time. A good Social Media Manager will take the burden of planning, creating, and posting. Giving you back hours of time each week, while making sure your business stays top of mind for your customers and potential customers. When people see you have an active social media presence where you are sharing the day to day of your business as well as providing value to your community you show you are an authority in your industry. It’s a great way to show you know what you’re talking about without being arrogant. Social Media Managers keep an eye on and help facilitate an active social media page which will encourage engagement from your followers. Likes, shares, comments. All of these things come from an active channel with followers who come to you to solve their problems. Ultimately what all this comes down to is a Social Media Manager is there to help you attract new customers. We’ve gone over how you either don’t have the time or don’t want to spend the time crafting content and strategizing campaigns. However, you need to Establish Authority and Increase Engagement. The items in this list are necessary to help you grow in the modern world where your online presence is just as important, if not more important, than your storefront. Your Social Media Manager can help take this burden off your plate and spend the time to get you on the right track. Our goal is to communicate to your audience what you want to say. If you’re ready to stop waiting for someday and start getting your Social Media Channels attracting new business contact us. We’d love to help you get noticed and stay top of mind. Connecting to the community around you. 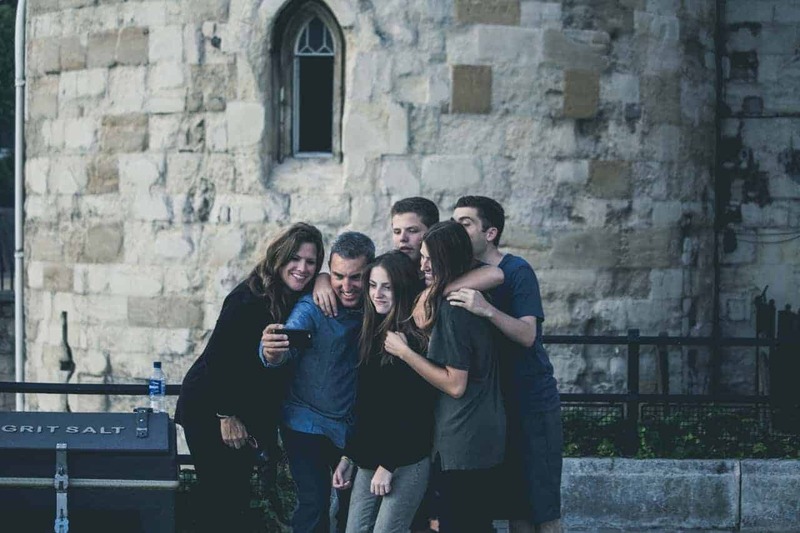 If you own a local business where the majority of your customers are located in one area you should be using Social Media to connect to the community around you. Making yourself a part of your community is simple and easy. If you live in the community you know what things are happening around your community. What things are important to your community and what types of things affect your community? Just by taking that knowledge that you already have and sharing it with your audience you will seem more engaged and a part of your followers lives. Remember you are people selling to people (read more about that). So what are some things that you could post about? Weather– As simple as posting about the good weather or a warning to prepare for bad weather. Community Events and News– Special concerts, festivals, parades (many of these events will have Facebook pages or events you can share) Human interest stories shared by your local paper. Is your town rallying around a certain family or event show your support (Look for hashtags and utilize them). Local Sporting Events– Did the local high school win State football? Congratulate them! Can you post the schedule of games? Does your business sponsor a team? Local Charities– If you support local charities or are going to participate in their events sharing a photo on Social Media is a great way to show your commitment to your community. To make sure you don’t come across as bragging make sure you highlight the charity’s good work more than your donation/participation. Personal Politics– people are passionate about their political views and taking a stance only opens up your business page as a platform for debate. It is best to avoid it all together. Bashing Other Businesses– This comes across as desperate and unprofessional and opens you up to criticism and retaliation. Other Topics?– There are a variety of other issues that could offend (sexual content, coarse language, etc) filter what you post through who your audience is and the community you are in, to avoid losing followers and even worse creating enemies. As you make your business more present and active on Facebook or other social media channels it is a good idea to come up with a Social Media Policy for your employees. They way they represent themselves in the community on Social Media will reflect on your business. We will write more about this in a future blog. 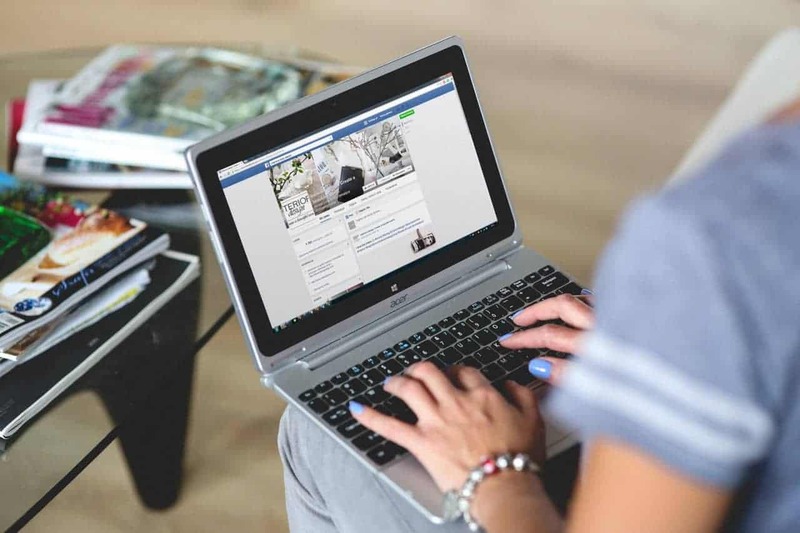 Why should your business have an active Facebook account? Facebook is the way people share their lives. They share their interest, hobbies, and opinions. They stay in touch with friends and family they use it like a scrapbook they share with the world. They use it to get news and find out what is happening in the world around them. They use it to connect to the world around them. Your customers are there doing life your business should be there too. Think of Facebook as having the opportunity to have your customers, like friends, over for dinner. At dinner you share funny stories about what you are doing, you provide value in the relationship, you invest in your dinner guest, caring about the things that they care about. You share helpful information. You share what makes you unique. Posting on Facebook for your business should be the same. Your customers are there, doing life, your business should be there too. People want to connect with people. Using your business’s Facebook page connects you to people. If you provide interesting and engaging content, not only sales pitches, you will stay top of mind and will create a connection to people that will translate to customers when it is time or keep your current customers engaged and invested in your business. If you imagined your Facebook and Social Channels as the storefront of your business, how would you treat it? Would you only open the doors every few weeks to post a sign about what you are selling? Would you let the appearance be messy and unkempt? Would your receptionist ignore people when they walked in and only give out a two-line sales pitch over and over without saying hello or asking about their day? Of course not! What is your lack of presence and consistency saying about your business? If you’re like most every other business owner, there is never enough time. Chances are you didn’t have time to read this article. So how does one reach this lofty goal of reaching all these customer’s and making a connection? You don’t, at least not alone. You let someone come alongside you and handle the content creation and grunt work. Then you commit to engaging, answering questions, and connecting. Like we said earlier, people want to buy from people. Interest, however, can be created without you. Once that interest has been peaked and someone asks you, “can you help me” you step in and do what you do best. If this is the type of partnership your company has been missing in this new modern era, give us a call or contact us. We would love to help you get back in the game, and engage with your customer on their level where they are looking.